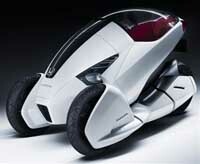 Honda represents a modern and very convenient electric personal transport. It's the Honda 3R-C, a solo-commuting concept, that will make its world debut at the Geneva Motor Show next week. The Honda 3R-C concept looks a lot like a motorcycle from the rear. The three-wheeler has its drivetrain mounted low, giving the vehicle a low center of gravity to improve stability. It has a clear canopy that covers the driver's seat while it is parked and not in use. When 3R-C vehicle is in motion, the canopy becomes a windshield that provides the driver with some measure of protection. It has high sides to its safety-shell body to further protect the driver and a fair amount of storage space in front of the driver in a trunk. The 3R-C study was created by European designers working at Honda's Research and Design facility in Milan.